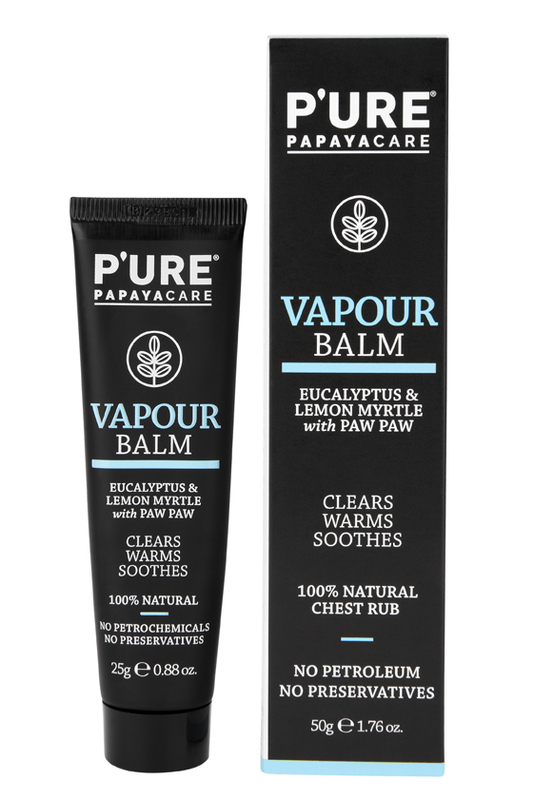 Clear, warm and soothe naturally with PURE Vapour Balm. PURE Vapour Balm is an all-natural gentle formula to soothe & clear. Breathe easy with this natural & warming blend of traditional Australian Essential Oils & Herbs including Organic Papaya. Discover the health benefits of Australian Native Oils & herbs. Gently rub on to the chest or back to soothe & warm. Suitable for the whole family including children over 1 year. For those under 1, apply Vapour Balm to a tissue and leave out of reach. Suitable for adults and children over 12. Pregnancy: consult your healthcare practitioner. PURE Vapour Balm is also great for use during air travel. Cocos nucifera (Coconut) Oil, Butyrospermum parkii (Shea Butter),Beeswax, Eucalyptus radiata (Eucalyptus Australiana), Melaleuca ericifolia Smith (Lavender Tea Tree), Eucalyptus dives Schauer (Peppermint), Carica papaya (paw paw) ferment, Backhousia citrodora F.Muell, (Lemon Myrtle), d alpha tocopherol (Vitamin E). I am loving this and use it instead of Vicks , I would like to see a bigger tube or container of it. Because the size is just too small . I would happily pay the price for a larger size . Used this recently when I switched from a toxic brand and helped shorten the duration of my cold and my sons and smells beautiful! I love this as an alternative to Vicks. My kids give this one the tick of approval. Not too strong but it actually works, unlike so others they didn’t like. Best thing about being sick! Absolutely loved using this product, I didn’t even mind having it on when I had to go to work with a cold because it smelled so lovely… similar to Vicks but much nicer I think. Does what it is supposed to, helps you feel relaxed and breathe easier, perfect after a nice hot shower/bath. Such a lovely and strong scent but feels better to put something natural on instead of chemicals. I am glad I picked up a tube of this after seeing people raving about it on Nourished Life’s FB page as my little one came down with a cold shortly after. The scent is divine and you only need to use a little bit. It felt very warming to the touch after rubbing in. It would be good if this came in a larger size. I received a sample size of this product in a recent order and have just ordered the full size product. It smells amazing and helps breathe easy. Has helped me sleep much better the last week. Highly recommend! I tried this product via a sample included in a recent order. I was congested and coming down with a cold. Rubbed it on my chest prior to bedtime. Worked so well, slept soundly and it cleared my breathing. Just awesome. Definitely purchasing for my family to get through upcoming winter months.